If you remember from my last blog post, the AnnTheGran web site got its name from my AOL sign-in. I promised to tell you the story of how annthegran became my AOL sign-in. Like most stories like this it’s pretty simple and fairly silly. Several months passed. The kids moved out after Christmas and bought a new computer. They gave me the old one as a belated Christmas gift. I was delighted. Soon after, my son-in-law came over to get me hooked up to the wonderful and mysterious Internet. AOL wanted to name me anncobb129 or something and every combination of my name or initials was rejected. Finally I said, “AnnTheGran has 10 letters. Try that.” Well, you know that one worked. While I was trying to remember the name of that game I Googled “Old PC games” and there it was. A free downloadable version was available, but it didn’t want to work on my Windows 7 computer. I did find a version that would work on my phone, though, but I still haven’t been able to get past level one. I also promised to tell you something about the early days of the Design Exchange. First I didn’t know how to make separate zip files for downloading. Whenever I received new designs I added them to the original zip file. If anyone wanted the new designs they had to re-download. Eventually I figured out how to post pictures with a hyperlink for downloading. This was 1996. Scanners cost thousands and color printers cost hundreds. I did have a little device for scanning photos. I can’t remember what it was called, Easy Photo or some such thing. My work around to get pictures of the designs on the web site was to stitch them out and paste four on a sheet of paper. I took that to Kinkos and they made me a color scan for two dollars. I would cut that up into the original four designs and those would fit into the photo scanner. I then punched holes in the paper with the stitched out designs and put them in a notebook. I have that notebook somewhere; I’m sure of it. What would you like to hear from me? Let me know so I can keep you reading. 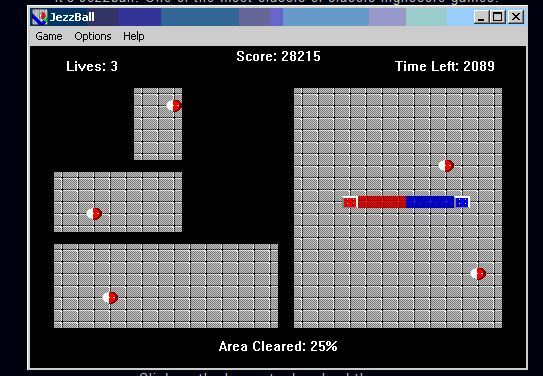 JezzBall was MY FAVORITE too! I have looked everywhere for it as well. If anyone knows where we could find it, let's give it another try! I love how you were what I call "computer hesitant." It means that you would love it if you were not concerned about being embarrassed by your first attempts. Let me say, I tried to help my favorite Uncle but he was a very accomplished man but had no idea how to hold the mouse. It was touching for me to see him try. If you got this far, just like embroidery, you don't know your abilities until you try! Here is a tip - if you are using a mouse - or have what is called 'right-click,' check that out. What ever program you are in, the right-click will give you options/shortcuts that will make your computer time easier. Some of the right-click features will be the same but you will find some that are content specific. That just means that in Word, you will find 'x' number of features and in Outlook, you will find 'y' number of features, some of which are the same. Remember - try is not just for restaurants - try is an activity! I would LOVE to know what types of embroidery do you do now. Are you still testing things or do you just create from the great designs here at AnnTheGran? When you embroider for fun, what do you actually enjoy doing? Share a tip that you think is really obscure - we all have them! Try here for the game. I too am glad to have you back and hope you will do another Community Circle. I met some really great friends through the last one and have stayed in touch with them. I would love to go to another one. Keeping It Simple - Halloween Decor Cast Iron Is for the Collectibles!